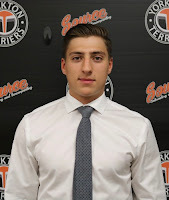 The Yorkton Terriers stormed back late with two goals just 1:02 apart in the 3rd as they went on to defeat the Estevan Bruins 6-5 on Tuesday night from the Farrell Agencies Arena. Chantz Petruic led the way with 2G 2A while Colby Brandt also added two goals while Mason Mullaney and Cody Bruchkowski chipped in with singles. Ryan Ouellette turned aside 33 shots to earn his 14th victory of the season. Devan Harrison, Turner Ripplinger, TJ Irey, Tyson Manz and Bryce Platt replied with the goals for the Bruins. With the win the Terriers now hold the tie-breaker if needed with Bruins after winning the season series 5-3 and also pull back within 2 points of Estevan for top spot in the Viterra division. The Terriers' will head back on the road this weekend starting on Friday night when they visit the Battlefords North Stars. GX94 will broadcast the game with Yorkton Dodge Junior Hockey your "Sask Milk" pregame show begins at 7:20, PXP kicks off at 7:30 from the North Battleford Civic Center. Meanwhile for the Bruins, they'll kick off on a weekend home and home series on Friday night hosting the Melville Millionaires.